For several years, now, I’ve been working on breads. I’ve done sourdoughs, whites, ryes, sweets, whole wheats, all kindsa breads. 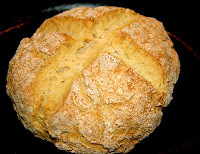 But, the one kinda bread that has forever eluded my success is the Irish Soda Bread. I’ve tried it many times and always failed. Most of the time it would turn out like a brick. Sometimes the inner crumb would be fairly soft, but even that was usually pretty dense, and the crust would be like a suit of armor. I studied and researched and tried very hard to figure out why it wasn’t working. I saw many recipes, and many of the ones that looked light and fluffy read more like cake recipes than bread, with lots of sugar and eggs. It just didn’t seem like the Irish soda bread I was shooting for. Crusty is fine, as long as it’s still soft to the teeth. I wanted it to puff up and brown in the oven. I also was shooting for a crumb that had air bubbles in it, not huge ones, but enough to make it easy to eat. I remember that I came across one site where someone clearly had an axe to grind, as he was trying to preserve the concept of a “traditional irish soda bread”. The problem is that, even with all this study and learning, my soda loaves still would turn out as if they could easily be used to grind axes. Practical, but that didn’t make them any more palatable, even with butter and jam. I did learn, however, that dutch ovens (or something like them) were often used to bake traditional soda bread. They were big cast iron pots, and they often had sharp bumps on the underside of the lid. When cooking, especially meats, these would be points where the steam would gather and drip back down onto the meat. This earned them the name “bastibles”. I just didn’t feel like I could claim any authority as a dutch oven bread baker if I couldn’t do a decent chemically leavened bread. I knew that it COULD be done in a dutch oven, but I just couldn’t seem to be able to pull it off. I started by lighting the coals. Once those were showing some good white burn, I set the dutch oven (with a spritz of oil on the inside), on and under the coals. While that was pre-heating, I set about making the dough. It goes really very quickly. I added all of the dry ingredients together in a bowl. I sifted in the flour, mainly to aerate it. Notice, also, that I didn’t use bread flour. In my studies, I’ve learned that chemical leavens don’t rely on gluten strands to trap the gas, and rise, like yeast breads do. Instead the chemicals interact, create the gas, which is trapped by the liquid and the fats in the buttermilk. It’s also the acids in the buttermilk that react with the soda that produce the gas in the first place. Then, I made a well in the middle, poured in the buttermilk, and gradually stirred it in. Soon, it was clumping together. I reached in with my fingers and kneaded it in the bowl, and shaped it. This is a very important part: Don’t work it too much. It’s NOT a yeast bread where you’re kneading it for 20 minutes or more. A few squeezes and folds to mix it well and a bit of shaping and molding and you’re ready to go. I shaped it into a disc about six inches by about an inch and a half high. This is another important part. I don’t know how I missed this, but in the past, I always shaped it into a ball. I think that had a big, big impact on how much it rose up and how the heat could cook into the bread. I cut a cross pattern on the top of the bread. There are all kinds of stories about why this bread is traditionally cut with a cross on top. I’m a kind of practical guy, so I know why I did it. One: it allows the bread to spring up and spread. Two, it gives it a place to vent a lot of the steam as it bakes. And, three, it makes it very easy to break into four even pieces once it’s done. Finally, I took it out and put it into the dutch oven. It looked kinda small and pathetic when I put it in, actually. It made me think that next time, I’d probably double the recipe, or cook it in the 10” instead. I ended up cooking it about 40 minutes, I think. I would recommend it be cooked to an internal temperature of 160-180. I did this one to 190, and it was a little too crusty, I think, especially on the bottom. Resist the urge to add too many coals underneath, by the way. Watch the bottom coals, and do some replenishing so they don’t burn out, but don’t go crazy with it. Because I was so uncertain about how to do it this time, I also checked it a bit too often, I think. Every time you pull the lid, more trapped heat escapes. In the future, I won’t feel like I have to check it as often. In the end, it swelled up fine, and it tasted great. It smelled wonderful as well. I’ve learned that traditional Irish soda bread is a totally different animal from yeast breads. In order for me to successfully make this loaf I had to separate myself from much of what I had learned about yeast bread making. You inspired me to try a loaf today in my DO. Thanks to your terrific tips, my bread came out wonderfully. I took your advice and preheated my oven to around 450 degrees and didn't lift the lid. At around 35 minutes it was cooked to perfection, I am enjoying a warm slice now with a chunk of sharp cheddar cheese. My Irish ancestors would be proud. Thank you for all the great advice, I follow your blog faithfully and have enjoyed it so much! We are dutch oven cookers and we like your blog and wanted to share our blog with you, it is... trailheadkitchen.blogspot.com We have been blogging for less than a year and started cooking in some cook offs last summer and are having a great time. I love Irish Soda Bread! It's heavenly with butter. Haven't had it for years, since an Irish lady gave my mom a loaf years ago. I've been looking, but can't find it anywhere. I'll give your recipe a try sometime. Thanks!